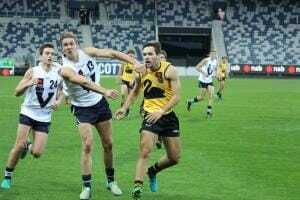 DRAFT ANALYSIS: "A small forward who can push into the midfield, and is especially dangerous around goals." Tyron Smallwood first announced himself as serious draft prospect when he booted six goals against Australian Capital Territory (ACT) in the 2015 Australian Under 15 Football Championships. He continued to gain attraction the following in year in the AFL Under 16s Championships with sensational performances against Vic Metro (two goals) and Vic Country (17 possessions and a goal), highlighting his class inside 50. Then this year he played more as a midfielder highlighting his versatility. In just six games for Claremont’s Colts’ team, he polled 14 votes in the Jack Clarke Medal and 10 votes in the WAFL Colts Coaches Award, after averaging 24 possessions, five tackles, four marks and kicking seven goals. He also made his WAFL League debut against Swan Districts in round 21. Whether Smallwood plays through the midfield or in the forward half, he has a nice blend of skills, smarts, defensive pressure and scoreboard impact. While he could build more size and improve his speed, he has some real natural talents to look out for in this year’s National Draft. When in the forward line, Smallwood plays as a “link-up” player much like Adelaide star Tom Lynch and he plays the role perfectly. His ability to penetrate the defensive zones with his elite kicking combined with his incredible footy nous is sublime. Smallwood often makes the right decision with ball in hand, due to his incredible vision. Smallwood has also shown outstanding defensive traits, especially with his desire to chase and tackle. For Claremont’s Colts’ team he averaged five tackles per game, for Claremont’s Reserves’ team he averaged four tackles per game, while for Western Australia he averaged five tackles. Even if he does not lay a tackle, his chasing pressure often forces his opponent to turn the ball over. Like any good small forward, Smallwood also knows how to kick goals. In six games for Claremont’s Colts’ team, Smallwood booted seven goals playing primarily as a midfielder, while in the Reserves he booted 10 goals from just four games playing as a small forward. It is also worth noting that Smallwood made his WAFL League debut in round 21 against Swan Districts and did not disappoint with 11 possessions, three marks and a goal. He also played a part in the Tigers’ finals campaign and did well both against East Perth in the Elimination Final (eight disposals, three marks and one goal) and West Perth in the First Semi-Final (11 possessions, three inside 50s, and two tackles). By seeing Smallwood already playing against bigger bodies, it is clear he is ready from the get-go. With big-bodied midfielders in vogue, it will be hard for Smallwood (179cm) to break into the midfield. Albeit, he has the potential to play like Luke Dahlhaus when in the midfield considering his hunger for the contest. Dahlhaus’ ability to get forward and have an impact is also noticeable, but Smallwood’s first improvement is to continue building size to be able to spend more minutes in the midfield. His speed is also a factor, as he does not have the blistering pace other similar shaped players have. In saying that, his endurance is very good and the more he uses that to his advantage the better. Given he has the skills and natural smarts, Smallwood’s speed is not something that limits him from performing, but just an area that can be worked upon in the future. Tyron Smallwood is a small forward who has the potential to play midfield due to his skills, decision-making and two-way running. He has already shown that he is capable of matching it with men in the WAFL League, playing two finals and not looking out of place. He has a strong blend of smarts and skill execution, and does all the defensive things asked of him by a coach. He does need to build some size, and is not the quickest small forward going around, but he knows how to combat situations thrown at him, and his versatility and decision making is very good.